The struggle for innovation alignment is one of those real challenging issues that are seemingly very hard to resolve, or so it seems. I’m not setting out a comprehensive solution here, well not in this blog, of the suggested ways to address this strategic/innovation alignment issue, as that is far more complex. All I will offer at this point of time is this alignment concern is becoming increasingly top of my mind. 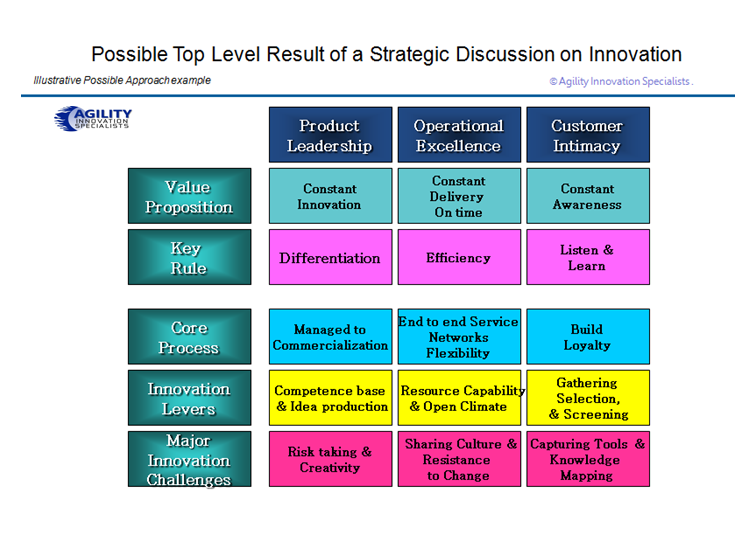 What I am offering here is an innovation conversation framework, on how we can approach different strategic value propositions, and where we might need to debate these across the organization, as the points of impact so we can make this move towards a higher degree of innovation alignment. If we take the three ‘classic’ strategic thrusts of product leadership, operational excellence or customer intimacy, just for illustrative purposes here, then we need to make clear the potentially different emphasis points within any suggested innovation approach that we should take. We must, within any innovation approach, be clear on what and where we should be placing our primary focus. This framing can be most useful to remind people who are involved that there are significant points of difference. There is a need to agree and align on what we are driving our innovation activity to support any selected strategic direction. This framework can really open up the discussion. It can begin to show the possible implications and challenges ahead. Equally some might argue that you actually need to combine all three, well I’d certainly want to question that really hard on whether this is possible all at the same time. I would really doubt it, if you just consider some of the aspects I’ve laid out within this framework above. If it is still demanded, and some leaders can be just that, demanding, I would suggest you really do need, even more, a framework to remind you of the critical differences and what aspects need clear focus to deliver to the distinct value proposition parts. Each strategic value proposition has significant implications to plan and work through. Having a top picture of the where to place your emphasis makes some sense. I’m not saying these shown are the ones you will have within your boxes but all I’m offering here, is a suggested framework that captures the key strategic emphasis points, so as you can engage in a deeper discussion before you launch yourself in blue yonder. This framework can help you to contribute to achieving a greater alignment between the strategic direction (product leadership, operational excellence or customer intimacy) and the key innovation aspects that help to align to this that the organization will need to think about and work through. In a recent leadership study on innovation by Capgemini Consulting, one of the studies top line concerns was the lack of a well-articulated innovation strategy, and then beyond this, a lack of organizational understanding of the linkages required. It is amazing how many organizations lack a clear innovation vision and an explicit set of statements from the Chief Executive or their designated C-Level Officer on innovation. This visual I came across some years back, and for me, it is outstanding in providing the feedback loops that go into developing the right innovation vision. 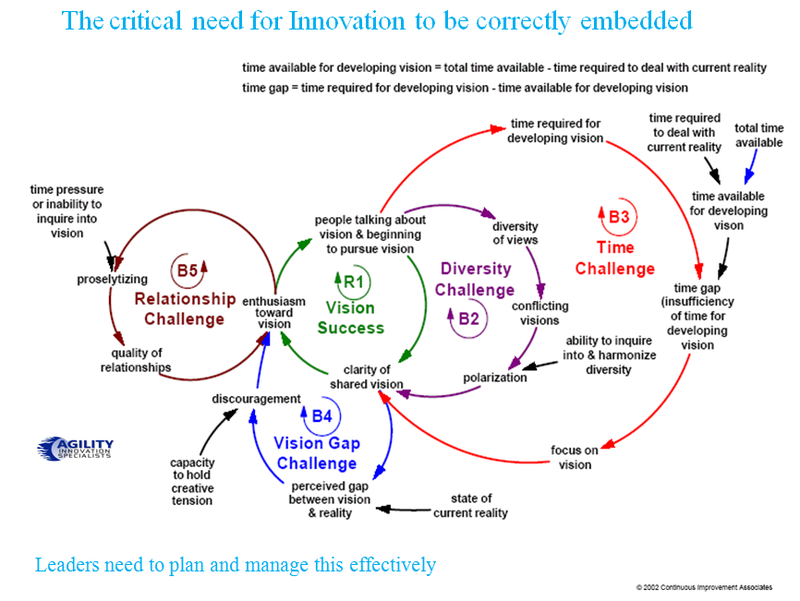 To get to a definitive end point of having an innovation vision you are faced with some complex challenges. These are well shown here. Each influences the other and constantly loop back, making hopefully an improving vision success. The different challenges seen in this terrific depiction, provide the sort of dialogue and efforts that needs to go into ‘crafting’ the innovation vision. It is hard, thoughtful work. Lets look at each of these a little more. Not only within the same board room do you have a diversity of opinion, you have that up and down any organization. Getting the views first out in the open, then managing the conflicting aspects and dealing with the ‘polarization effects’ all is difficult. This is where a dedicated focus, a Chief Innovation Officer, can really make a difference. To get people to talk about the vision, what it should stand for, what needs to happen leads eventually to a greater clarity. There is a reality to what and where you are and the perceived gap that need addressing honestly. This is something we tend to be very poor at, is, holding a ‘creative’ tension that can stimulate and create a vibrant and exciting innovation vision. We try to dampen the divergence in opinions far too early so we can (quickly) got to convergence. This ‘keenness’ to take away the ‘creative’ tension tends to replace it with potential set of ‘destructive’ ones and this often creates much of the beginnings of the barriers to innovation. People resent not being well listened too or allowed time to develop their arguments. If you get people to ‘freely’ talk about innovation, its importance, its impact and can ‘paint’ the future in broad brush strokes, they achieve a growing clarity and enthusiasm and that often missing critical component a sense of shared identity. Innovation is complex; it deals with formal and informal mechanisms. There is an awful lot to constructing a solid innovation vision but believe me, it is even harder to understand the right components that make up the innovation strategy, so it does eventually become a well-articulated innovation strategy. More on this to come at a later date.